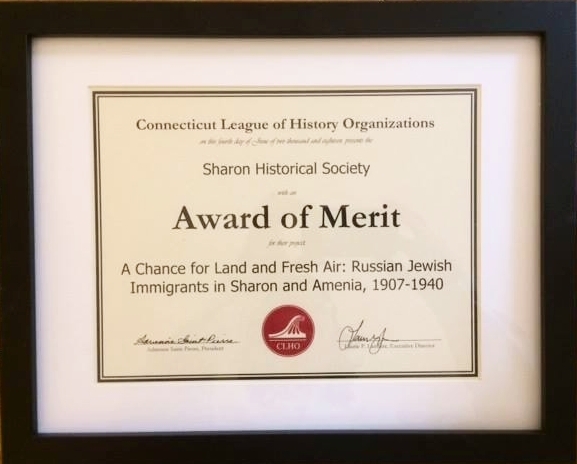 The A Chance for Land and Fresh Air exhibit at the Sharon Historical Society that inspired the book has been honored with the 2018 Award of Merit by the Connecticut League of History Organizations. The award letter stated, "the committee is very impressed with the exhibition, in particular the connections made between local and world history, and between the families documented in the exhibit and their own descendants." The exhibit was on display at the Historical Society between October 2016 and April 2017. The exhibit is now permanently installed in Amenia’s Congregation Beth David. Carol is the recipient of the 2018 CultureMax Heritage Professional Award from the Northwest Connecticut Arts Council for her exhibit, "A Chance for Land and Fresh Air" at the The Sharon Historical Society.